It was a very surprising 69th Emmy Awards when Sean Spicer pulled an Alfred Hitchcock and left everyone completely stunned! 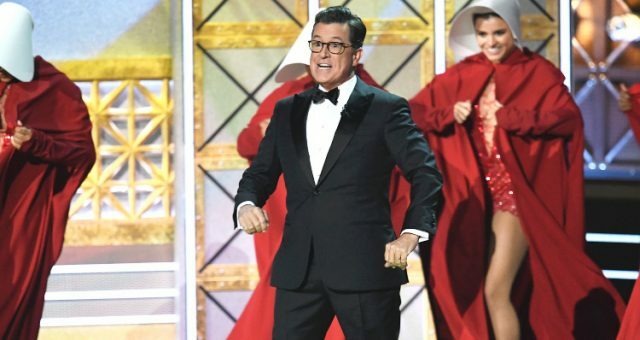 With Stephen Colbert hosting his first ever Emmys, nothing was off limits and everyone loved it. Check out what Sean Spicer had to say at the Emmy Awards 2017 and why Melissa McCarthy’s name was thrown into the mix! After Stephen Colbert smoothly made his way on stage to give his opening monologue, he gave us his topical antics and the best jokes in his book, raising expectations for the night. Things took a turn when Colbert rolled out some of his Donald Trump jokes. 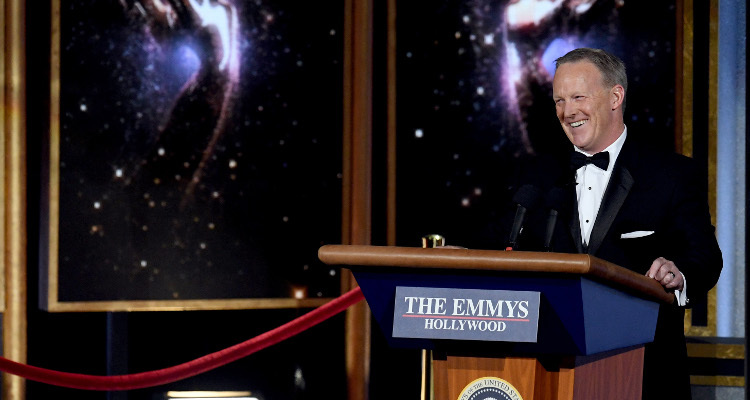 But before you knew what to expect, Sean Spicer was on stage with his infamous podium, this time with “The Emmys” written on it! Spicer’s appearance was a ginormous surprise to everyone, and the cameras went straight to none other than Melissa McCarthy, who won an Emmy for hilariously portraying Sean Spicer on SNL. Even she looked surprise, and could not help but laugh along! It all began when Colbert joked about the size of the Emmy audience, with a read-between-the-lines reference to Donald Trump’s inauguration audience. At the time, Trump’s former Press Secretary, Sean Spicer had addressed the media for the first time, claiming that the inauguration had the largest audience “period.” Other than the fact that it was crystal clear Trump had a smaller number of people show up, Spicer was also criticized for his aggressive tone. It was something that he was roasted for, and was the first of many speeches that were parodied on shows like SNL. Sean Spicer resigned as Press Secretary in July, and officially left his post on August 31, 2017. 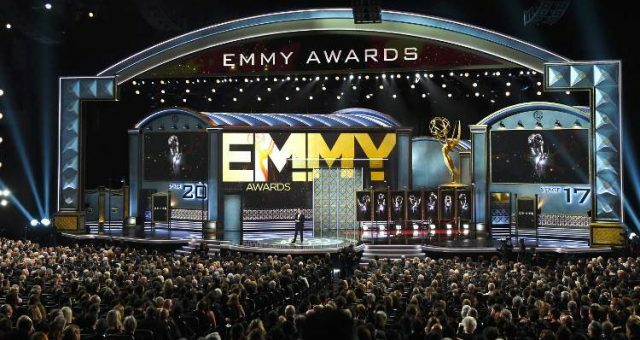 At the Emmys, Spicer himself was actually on stage, rolling his podium saying, “This will be the largest audience to witness an Emmys, period, both in person and around the world.” It looks like he is finally able to poke fun at himself. But with a joke so good, you can’t help but get in on the act! Stephen Colbert was quick to throw shade at Trump, saying that Spicer eased his “fragile ego,” adding that he gets why the President wanted a guy like him around. 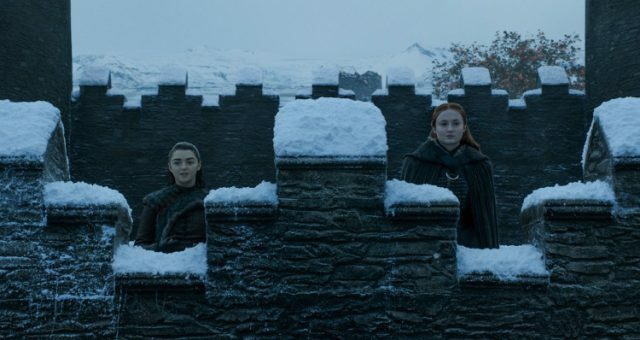 Colbert ended the bit saying, “Melissa McCarthy everybody, give it up!” It was all in good humor, and though some people on Twitter have criticized the cameo, many enjoyed it!